AGORA free Online Course took place again at the beginning of 2018 ! 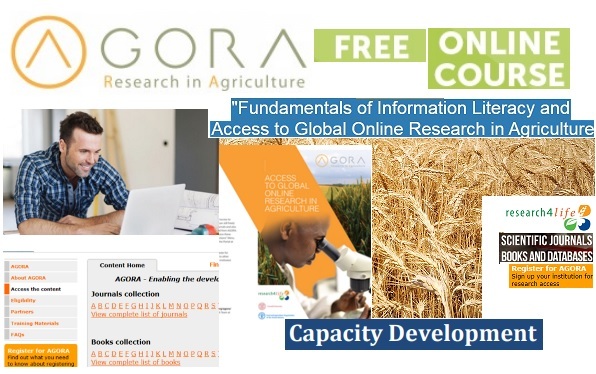 AGORA team started the year with the AGORA online course entitled “Fundamentals of Information Literacy and Access to Global Online Research in Agriculture”. The course was run first time in October 2017. Applicants who were placed in January 2018 group in the first call took the AGORA free online course from 29th January through 9th February 2018. In January 2018 group, over 200 people from 43 different countries were reached ! The AGORA online course is provided by the FAO of the UN in collaboration with Research4Life Initiative. The course aims to deliver information about the fundamentals of information literacy competencies and develop necessary skills to access and effectively use AGORA (Access to Global Online Research in Agriculture) which is a collection of up to 6,100 key journals and up to 23,000 e-books to more than 3,100 institutions in more than 115 countries. ... is to enhance agricultural research in developing countries by supporting access to peer-reviewed literature in the fields of food, agriculture, environmental science and related social sciences. It is designed specifically to serve the needs of researchers, academics, research officers, librarians, IT specialists, other practitioners and students. ... researchers, academics, research officers, librarians, IT specialists, other practitioners and students from AGORA eligible institutions in eligible countries. Anyone working or studying in agricultural and related sciences can apply for the course. Priority is given to anyone from Research4Life eligible countries, Group A and Group B respectively. ​For more information and other details, please see the Course web page. The AIMS Team at FAO of the UN offers a number of other e-learning programs in terms of Capacity Development. Later in the year of 2018, some courses will be repeated and we will announce the calls for applications through AIMS web site as well as AGORA website. Please watch these spaces for upcoming events.